May is a huge month for our family. My sister, father, husband, twin sons, and brother-in-law have birthdays all in the SAME week. 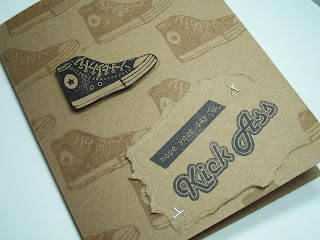 I made this card for my BIL with a great set from WPlus9 and a handmade Converse chuck stamp from Etsy seller sugarskull7. Gotta love the 80's vibe.